Will save hours in useless cartridge blowing! Not hard to do, use an eeprom that is far larger than the stock one and simply toggle the high address lines to enable new sections. This is really old school stuff we used to do back in the days of the TRS-80 Color Computer and the C-64. An elegant way of handling this. “Sorry if I, uh, gave anybody a siezure”… CLASSIC. love it. OK, this is a retro dude’s dream. @fartface indeed. I use the same method to do animations on an LED panel where the smallest memory I could find was > 256B, so I used the extra address lines tied to a binary counter to cycle through the memory blocks. That is absolutely old school cool. Indeed, very nice. I am a bit envious. I used something like this when I was a kid. My neighbors brought it back from vietnam back when the nintendo was still fairly new. It was 2 cartridge segments that when put together were the size of a normal cartridge. It was like a top 50 games or something like that. I thought it was the greatest thing in the world. Thanks for reading everyone. The real point of this project was to make use of the binary counter, obviously the idea of stacking ROM images together isn’t anything to get excited about. 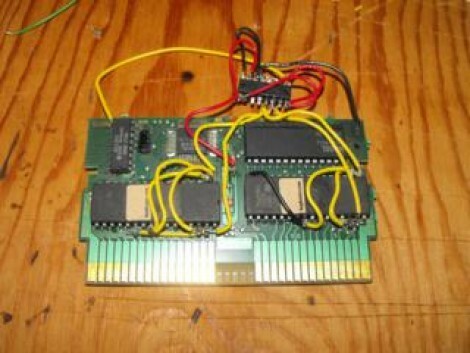 @usedone, that’s a Famicom multicart you had, most likely 52-in-1, attached to a NES converter. If you check my article and scroll down to the first video, you can see a Famicom game and converter on my NES console, it should look familiar! My neighbors brought it back from vietnam back when the nintendo was still fairly new. Would it be possible to Mod a Gameshark for n64 to be able to run roms on the console? Any way to make a menu system to have specific roms load on purpose?